The latest in provincial waffling on a viable, sustainable, full-fledged transit policy. 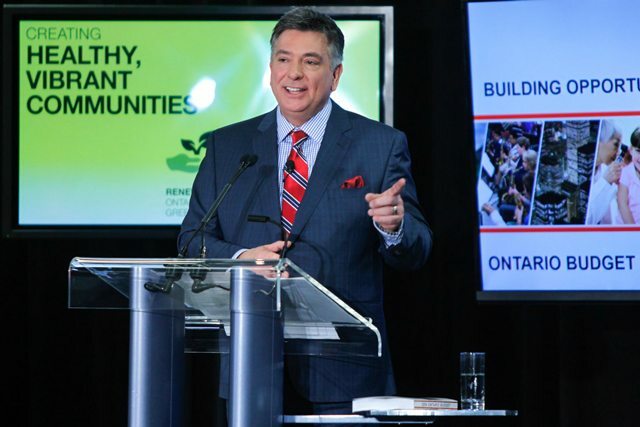 Finance Minister Charles Sousa, introducing the 2014 budget. 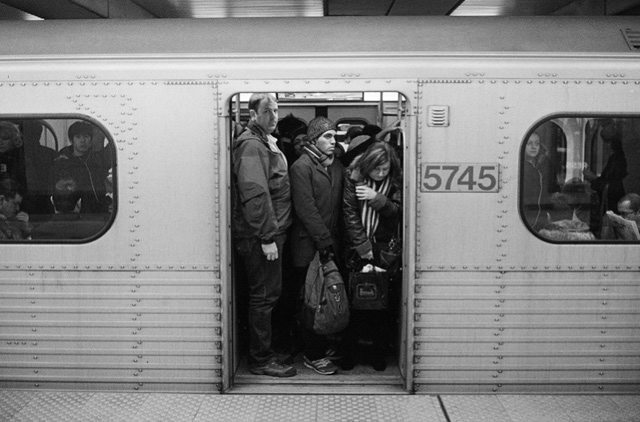 Photo by Christopher Drost/Torontoist. The Liberals’ proposed 2014 budget shows that the current government has neither the conscience nor the confidence to make good on those intentions. Making matters worse, neither opposition party shows any indication of offering a useful alternative. Photo by tapesonthefloor from the Torontoist Flickr Pool. 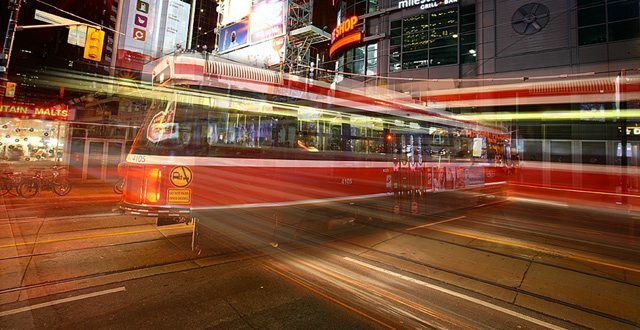 The province’s expert agency created specifically to handle regional transportation, Metrolinx, has estimated it will take $34 billion to begin to meet our transit needs—and that’s just what we need to keep pace with population growth and maintain the status quo, never mind reducing congestion in and around Toronto. 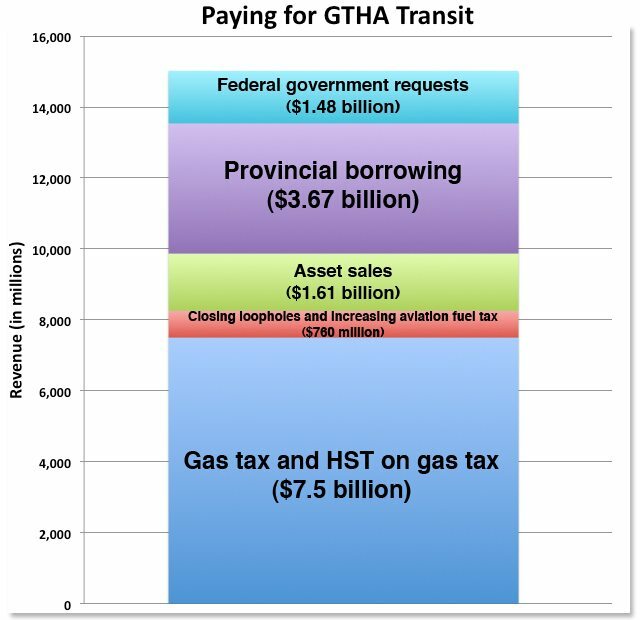 The largest slice of the transit funding pie comes from earmarking revenue from the gas tax and the HST that’s levied on the gas tax. Because neither the gas tax nor HST rates themselves would increase, this isn’t new money, but a reallocation of existing funds—thereby creating a hole in the budget, which needs to get filled with other revenue sources. To offset this $7.5 billion, the government proposes to increase personal income taxes on individuals earning more than $150,000, which is projected to raise $745 million annually by 2017 (the proposed transit funding plan covers the next 10 years). The remainder would be offset with stricter enforcement measures for existing revenue sources, like capturing corporate tax avoidance and improving auditing measures. The province has proposed raising funds for transit through new “green bonds” as well as traditional bonds, for a total of $3.7 billion. But this is a financing tool, not a new source of funding—it would add to the government’s debt, and need to be paid back over time. While raising funds through debt is a reliable tool for investing in capital projects, no repayment strategy is spelled out in the budget plan. The government has repeatedly stressed that it needs new funding sources to pay for transit; this borrowing, while reasonable, does not move the needle on that big-picture issue. The budget document refers to this section as “asset optimization,” but what it really means is selling existing capital assets to fund the new ones we want to build. The budget doesn’t commit to specific asset sales, but it does list some examples, including: the LCBO headquarters, the Ontario Power Generation headquarters, the Lakeview generating station in Mississauga, and the Seaton Lands in Pickering. While this may be dedicated funding, it is a one-time cash-in on current assets, and does not represent sustainable, ongoing funding. This funding comes from the Building Canada Plan, a $47 billion federal infrastructure fund. The money in this fund is not guaranteed: municipalities and provinces apply for funds and the projects are approved based on a list of criteria. However, there is a specific $2.7 billion allocation for Ontario infrastructure projects within the $47 billion total, and Ontario’s finance ministry believes their $1.48 billion target is realistic. While this would be dedicated funding, it is neither sustainable nor guaranteed. Closing loopholes is a favourite proposal of risk-averse governments, because who could object to closing loopholes except the interests who benefit from them? Among the measures in this section are ensuring that big businesses do not claim the small business deduction (saving $50 million annually by 2017); increasing the tax on aviation fuel, which is a fraction of the tax on gasoline and diesel (generating $65 million annually by 2017); and a registration fee on road-building machines (generating $25 million by 2017). This pot of money would be split between the GTHA’s $15-billion transit fund and the province’s $14 billion for roads, bridges, and infrastructure in other municipalities. While these are specific, dedicated, new funding tools, they are nowhere near the scope that the region requires to meet its needs. Photo by Yeshwanth_enian82 from the Torontoist Flickr Pool. The Liberal government used to speak about our need for an honest conversation about how to fund transit and get the Toronto region moving. It stressed the importance of dedicated, sustainable, new funding tools that would make transit planning reliable and raise enough money to actually implement the plans experts recommended. If this budget represents the platform the Liberals intend to campaign on in the next election—one which may be called in a matter of days—then its transit strategy shows a lack of conviction in the expert advice they themselves commissioned. The transit funding plan contained in this budget falls short of the standards the current government set for itself, and should fall short of the standards Torontonians should set for their provincial government.